Global markets are reeling today as the Swiss National Bank abandoned the franc’s exchange rate cap against the euro. At one point, the franc was trading nearly 38% higher against the dollar and the euro, as major currencies reacted differently to this very surprising decision. The euro fell nearly 2% against the dollar but has since taken back most of those losses. In Asia, the Indian rupee advanced following a surprise interest rate cut and the Australian dollar was stronger following the December jobs report. As North American trading commenced, all eyes were on US weekly jobless claims, coming in higher than expected at +316k, but the Swiss remain the story of the day. Today’s move by the Swiss National Bank comes as a big surprise following an interview just two days ago when SNB Vice President Jean-Pierre Danthine said officials were “convinced that the cap on the franc must remain the pillar of our monetary policy.” No doubt Swiss retailers will be feeling the pain this morning as Swatch CEO Nick Hayek was quoted, “Today’s SNB action is a tsunami, for the export industry and for tourism.” Although Switzerland remains a neutral enclave amidst the European continent, this instability cannot be a welcome sight to policy makers in Brussels, weighing the prospect of large scale asset purchases. The EUR/CHF cap, which had been holding firm above 1.2000 for years, was as low as 1.0300 this morning. During Asian hours, it was Australian jobs numbers that paced markets. For November and December of 2014, employers added the most new workers in any two-month period over the past eight years. The number of people employed increased by 37k in December after a revised 45k increase in November. Thinking about this another way, the American population is roughly 14 times larger than Australia, those increases in the States would read 514k and 626k, respectively. The Australian dollar has risen nearly 1% in today’s trading as a result, but still remains on the lows of the year, depressed by falling commodity prices. Copper prices slumped nearly 8% this week, leaving a heavy burden on the AUD and NZD dollars. Turning to North America, there is nothing of note coming out of Canada this week. The Bank of Canada will convene next Wednesday for the policy meeting, one day before the ECB convenes for a hotly anticipated meeting. No change to rates is expected in Canada as the Loonie took a brief look above $1.20 this week before coming off over 1% in the wake of the SNB’s actions overnight. The FOMC released its “Beige Book” yesterday, expressing that most regions saw “modest” or “moderate” economic growth. Stronger employment and cheaper gasoline are spurning consumer spending, helping the US stand out as the one strength as European and Asian growth wanes into the new year. On the data calendar today it was US weekly jobless claims pacing trading as more American workers claimed first time unemployment benefits since the beginning of December. The dollar was unaffected. Closing out the week tomorrow with US inflation for the month of December, a 1.3% increase over the same period in 2013 is expected. German ZEW Economic Sentiment, Inflation data in New Zealand, Rate decision in Japan, the Eurozone and Canada, Employment data from the UK and the US and housing data from the US. These are the main market movers on Forex calendar. Join us as we explore the highlights of this week. Last week, US data failed to raise optimism with a surprise 0.9% drop in retail sales registering their largest decline in 11 months and a 1.0% decline in core sales. In the manufacturing sector the Philly Fed index fell to 6.3 points, while expected to reach 20.3 points. Jobless claims increased unexpectedly to 316,000 from 297,000 crossing to 300,000 line. However, the Empire State index surged to 10 points from 5.3 in the prior month. Will we see better figures this week? Eurozone German ZEW Economic Sentiment: Tuesday, 10:00. German investor sentiment edged up in December to 34.9 from 11.5 in November. This was the second consecutive rise, indicating increased optimism for a pickup in Europe’s largest economy. Economists expected a lower figure of 19.8. German economy expanded by a mere 0.1% in the third quarter, bit a boost in consumer spending is expected to improve growth in the final quarter of 2014. German analysts’ sentiment is expected to improve to 40.1. NZ inflation data: Tuesday, 21:45. New Zealand consumer prices increased 0.3% from the second quarter, falling short of the 0.5% rise expected by analysts. On a yearly base, consumer price index rose 1% in the third quarter after a 1.6% rise in the previous quarter indicating slower inflation. The absence of inflationary pressures enabled Governor Graeme Wheeler to keep borrowing costs unchanged for longer. Consumer prices are expected to remain unchanged this time. Japan rate decision: Wednesday. The Bank of Japan voted to keep its monetary policy unchanged at its December policy meeting, increasing its monetary base at an annual pace of JPY 80 trillion. The decision was in line with market forecast. The BOJ noted the improvement in exports and a recovery in industrial output as well as, rising inflation expectations. Rates are expected to remain unchanged this time. UK employment data: Wednesday, 9:30. UK Jobless Claims dropped in November by 26,900 beating expectations for a 19,800 decline. Furthermore, on a quarterly basis, average earnings excluding bonuses edged up 1.6%. UK unemployment in the third quarter fell by 63,000 to 1.96 million indicating an improvement in British labor market. UK unemployment claims are expected to drop 24,200 in December. US Building Permits: Wednesday, 13:30. The number of building permits issued in November fell 5.2% to a seasonally adjusted annual rate of 1.04 million, indicating weakness in construction of single-family homes. However, Analysts forecast the housing sector will maintain its momentum in 2015 as job growth continues and mortgage rates remain accommodative. The number of building permits is expected to increase to1.06 million. Canadian rate decision: Wednesday, 15:00. The Bank of Canada kept its rate at 1% in December, amid stronger economic recovery in exports and business investment. BoC’s statement was more optimistic than before amid widening expansion on top of strong consumer spending, which may lead to self-sustaining growth. Poloz said the said the output gap is smaller and that the economy has sufficient room to grow before it reached full capacity. Rates are expected to remain at 1%. Eurozone rate decision: Thursday, 12:45. The European Central Bank kept interest rates unchanged in December leaving deposit facility at negative 0.20%. Draghi said the central bank requires more time to assess the impact of dropping oil prices on inflation, growth and wages, before deciding the course of action. Falling energy costs will worsen deflation below the ECB’s target of just under 2%, but at the same time, may help the region’s economy by saving companies and consumers billions of euros. The ECB continued to examine a range of options for quantitative easing in case the measures it has already taken fail to boost prices. The ECB is expected to maintain rates this month. US Unemployment Claims: Thursday, 13:30. The number of initial claims for unemployment benefits jumped last week by 19,000 to 316,000, from a revised 297,000 in the week before. Economists expected claims to rise moderately to 299,000. The sudden increase is typical for the first full week of the year when holiday workers are fired. The volatility makes it difficult for the government to determine whether the number of applications has truly picked up. The four-week moving average increased to 298,000 last week from 291,250. The number of jobless claims is expected to reach 301,000 this week. A tumultuous week for the currency market has found the Dollar closing its fifth consecutive week in the green and well on its way to a record-breaking seventh consecutive month climb. Yet, whether this benchmark is able to keep pace or tumbles into a reversal depends heavily on what happens over the next few weeks. Before the Fed feeds speculation for the timing of its first hike on the 28th, the ECB will decide this week whether it will lever the Dollar’s appeal by expanding its own stimulus effort. And, with volatility trending higher and market shocks (oil plunge, Russia, the SNB) increasing in frequency; traders’ appetite for havens is raising the Greenback’s profile once again. In the Dollar’s climb these past quarters, much of the fundamental fuel that was siphoned for the move was sourced from the rate expectations. Yet, as persistent as the ‘mid-2015’ forecast for a first FOMC move has been, developments and data have offered a more neutral view of the liftoff. Adding to previous concerns of troubling international winds and tepid wage growth, this past week’s CPI reading showed headline inflation pressures were at a five-year low while the core level slipped to 1.6 percent. Market speculation surrounding the timing and tempo of the central bank’s rate regime has also weighed expectation. Fed Fund futures are now only pricing in a 0.42 percent benchmark rate by the end of the year. However, as debatable as the timing of the first hike is, what is clear is that the US is already on a much more hawkish footing than its counterparts. The Bank of Japan and European Central Bank are pressing unconventional policy while many others have been anchored to a neutral bearing with a dovish bias. That represents relative appeal for the Greenback. And, we will assess just how much comparative strength the currency can sustain this week. Preempting the Fed’s policy meeting towards the end of this month, both the BoJ and ECB are scheduled to deliberate on policy this week. After the surprise QQE upgrade in October, no new efforts are expected from the Japanese authority – but in such fractious financial circumstances, it is not impossible. Far more controversial is the ECB’s meeting on Thursday. As the Fed’s largest foil (and the dollar’s largest counterpart), the policy bearings from Europe are especially important. A full-blown quantitative easing program has been heavily suggested by President Draghi and other officials sometime in the first quarter. But, could actually come January 22? With a Greek election just days after the forthcoming ECB meeting and given the complexity involved with a multi-national stimulus effort; a deferred adoption would seem prudent. However, after the Swiss National Bank (SNB) shocked the market by abandoning its own monetary policy center piece (a 1.2000 EURCHF floor) this past week; there is growing speculation that the move was to preempt an imminent wave of easing and Euro depreciation. As it happens, this could also play a role in catalyzing ‘risk’ trends. Volatility has been building for months and currencies have been at the forefront of that development – the short-term FX reading is at its highest level in three years. With the SNB’s fireworks this past week, the appetite for safety has risen and its outlets have diminished. Dependency on a global pool of stimulus is driven by new bouts of economic hardship and its limitations are more discernable. If the ECB doesn’t fulfill expectations with the next infusion, it could potentially trigger a correction in European markets that quickly spreads through a susceptible global system. The most adept of wordsmiths might be forgiven for struggling to find an adjective strong enough to describe last week’s Swiss Franc price action. A quantitative description is perhaps most apt: realized weekly EURCHF volatility jumped to the highest level since at least 1975, swelling to nearly 2.5 times its previous peak. The surge was triggered after the Swiss National Bank unexpectedly scrapped its three-year-old Swiss Franc cap of 1.20 against the Euro, saying the “exceptional and temporary measure…is no longer justified.” Appropriately enough, the previous historical peak in weekly EURCHF activity occurred in September 2011 when the Franc cap appeared as suddenly as it vanished. Then too, the SNB acted without warning and sent markets scrambling. The announcement caught the collective FX space by surprise. Even the world’s top international economic bodies were apparently left in the dark. IMF Managing Director Christine Lagarde quipped that she found it “a bit surprising” that SNB President Thomas Jordan did not inform her of the impending move. “Talking about it would be good,” she added.St. Louis Fed President Jim Bullard hinted the US central bank was not notified either. The go-toexplanation for the SNB’s actionscenters around bets that the ECB will unveil a “sovereign QE” program following its policy meeting on January 22. Mario Draghi and company finally secured a green light for large-scale purchases of government debt after the ECJ gave clearance to the similar OMT scheme devised (but never used) to battle the debt crisis in 2012. 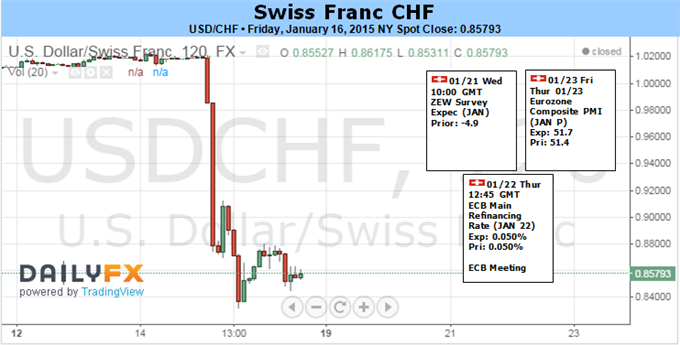 The SNB presumably scrapped the Franc cap to avoid having to keep pace with the ECB’s efforts. Another wave of Franc volatility may be ahead next week. While markets seem all the more convinced that an ECB QE announcement is in the cards after the SNB’s about-face maneuver, a delay in the program’s implementation (if not its formulation) is entirely plausible. Securing the acquiescence of anti-QE advocates like Germany to having such an effort in the arsenal is not the same as launching it. The ECB may yet opt to wait through the end of the first quarter as it has hinted previously before pulling the trigger, sending the Euro sharply higher. Measuring the fallout from the SNB’s actions is likely to be protracted however.The full breadth of the various ripple effects will probably emerge over weeks and months, not hours and days.The Franc now looks gravely overvalued against currencies whose central banks are set to tighten policy this year, with the US Dollar standing out as particularly notable. It seems prudent to let the dust settle before taking advantage of such opportunities however. 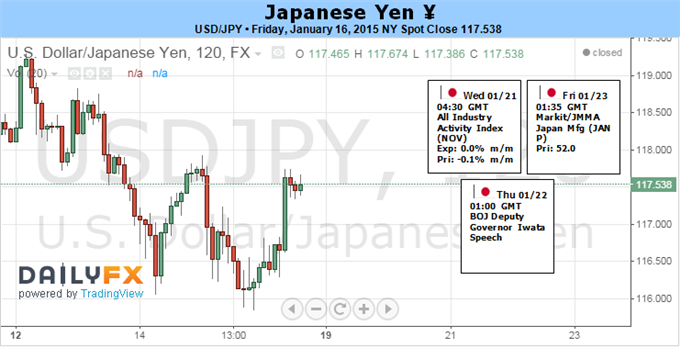 Price & Time: USD/JPY Topping Out Or Just Consolidating? USD/JPY may face a larger correction in the week ahead should the Bank of Japan (BoJ) remain confident in achieving the 2% inflation target and endorse a more neutral tone for monetary policy. Falling energy prices may prompt the BoJ to curb its near-term forecast for inflation, but recent comments from Governor Haruhiko Kuroda suggests that the board will retain its current policy at the January 22 meeting as the central bank head continues to see a moderate recovery in the Japanese economy. After unexpectedly expanding its asset-purchase program at the October 31 meeting, the BoJ may preserve a wait-and-see approach for most of 2015 especially as Japan’s Cabinet approves the JPY 3.5T fiscal stimulus package to encourage a stronger recovery. With that said, the fresh batch of developments coming out of the BoJ may fail to generate a more bullish outlook for USD/JPY, and the pair remains at risk of facing a larger pullback over the near-term as market participants scale back their appetite for risk. As a result, the dollar-yen correction may continue to take shape ahead of the next Federal Open Market Committee (FOMC) meeting on January 28, but the long-term outlook for USD/JPY remains bullish as Janet Yellen and Co. looks to normalize monetary policy later this year. In turn, the December low (115.55) remains in focus for USD/JPY as the pair continues to carve a string lower highs & lows in January, and the technical outlook certainly highlights the risk for a further decline in the exchange rate as the Relative Strength Index (RSI) preserves the bearish momentum carried over from the previous month. Gold prices are markedly higher this week with the precious metal rallying more than 4% to trade at $1272 ahead of the New York close on Friday. The advance marks the single largest weekly gain in ten months and took prices to the highest levels in four months. The rally comes amid broader declines in US equity markets with all three major indices ending the week off nearly 2%. A surprise move by the Swiss National Bank to end its three-year currency peg to the Euro dealt another blow to sentiment with gold the chief beneficiary this week. Looking ahead to next week traders will be eyeing key US housing market data with housing starts, building permits & existing home sales on tap. Consensus estimates are calling for a stronger series next week and could keep the US dollar on firm footing. It’s important to note that the USDOLLAR to gold negative correlation has been weakening since late October and despite the recent strength in the greenback, gold prices may continue to push higher as the global growth concerns take root. The main event next week will be the European Central Bank interest rate decision on Thursday where market participants are looking for a major announcement. On the back of this week’s shocking move from the SNB, speculation that the ECB will announce its quantitative easing program has kept European equity bourses afloat this week despite the losses seen state side. Should the program underwhelm market participants, look for gold to remain supported with the technical picture suggesting the medium-term outlook remains constructive. 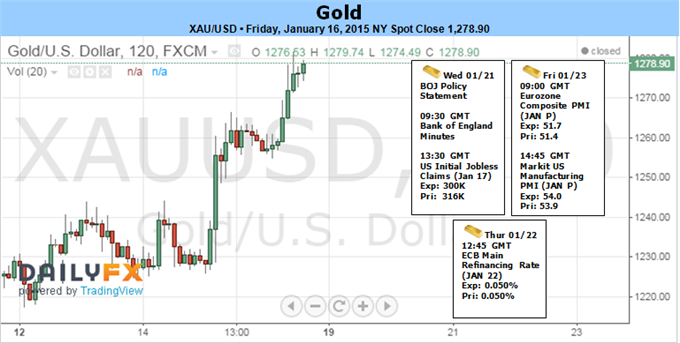 Last week we noted that, “a breach above resistance targets objectives at $1230 and critical resistance at $1236/37. This region is defined by the 2013 low-week close, the 50% retracement of the July decline and November median-line parallel.” The level held as resistance into Thursday before giving way to an advance into objectives at $1248 and $1262/68. 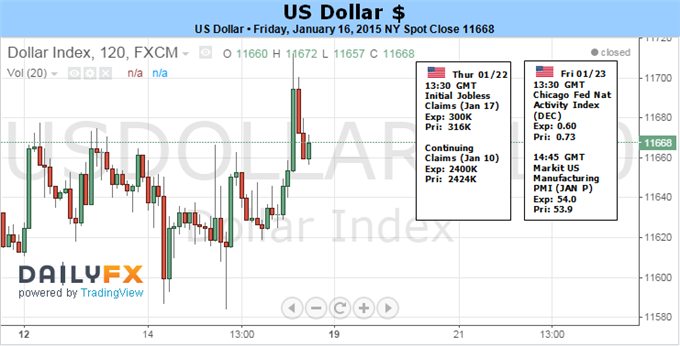 Friday saw prices stretch even higher into soft resistance at $1278. Look for a pullback early next week to offer favorable long-entries with the near-term outlook weighted to the topside while above $1248. A breach above resistance targets the 76.4% retracement of the July decline at $1294 and the upper median-line parallel of the November advance, currently just above the $1300-mark. The Nikkei spent the better part of the week falling, but found a bit of support and the ¥16,500 level, which of course was the scene of the most recent break out to the upside. Because of this, we are not interested in selling this market, but are simply waiting to see some type of supportive candle in order to buy the Nikkei, and perhaps try to grind our way back to the ¥18,000 level. We believe that will probably happen on shorter-term charts such as the daily or for our chart. With that being said, we are bullish long-term of the Nikkei, but recognize it long-term traders may have to put up with a bit more volatility than they normally choose to deal with. Ultimately, we think we are consolidating between the ¥16,500 level, and the ¥18,000 level above. That is a perfect rectangle essentially, and therefore we do like the idea of buying and not selling because of the fact that it comes after such a strong uptrend. On top of that, the Bank of Japan is working against the value of the Yen, and that ultimately helps strengthen the export market coming out of Japan. In theory, that should help bring the value of the Nikkei up due to exports and the fact that the Bank of Japan is also buying bonds and driving down yields in that market as well, essentially forcing money into the stock market by a domestic traders. We still believe that the ¥20,000 level will be targeted given enough time, but it’s obviously going to take a bit of work. This is a market that has seen significant upside recently, so that’s not a huge surprise. Ultimately, we feel that this market probably even breaks out above the ¥20,000 level, but with that being such a large, round, psychologically significant number, it’s likely to be one that’s going to be difficult to climb over. Pullbacks going forward should end up being buying opportunities but only if you can handle what is almost undoubtedly going to be a very volatile move. The USD/JPY pair fell initially during the course of the week but found enough support below to turn things back around and form a hammer like candle. That being the case, it appears that we are ready to grind a bit higher, but we need to get a bit of momentum in order to do so. That being the case, it takes a bit of force to break out, and we think that the market is simply taking a breather after such a massive uptrend. With that, we are buyers but recognize is going to take a bit of time. The S&P 500 fell initially during the course of the week, but found enough support below the 2000 level again to form a hammer. The hammer is a quite as impressive as the one before, but ultimately it tells us that this market has plenty of buying power underneath it. You will probably have to use shorter time frames in order to trade this market though, as it doesn’t seem conducive for longer-term trades at the moment. Nonetheless, we do believe that it goes higher, and we most certainly believe that you cannot sell it.